A spacesuit model poses in a new private spacesuit developed by inventing team Ted Southern and Nikolay Moiseev of Final Frontier Design. 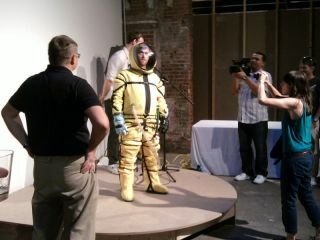 The spacesuit was unveiled at Eyebeam Art and Technology Center in New York City on July 16, 2010. Full story. NEW YORK ? Two private spacesuit designersunveiled their first steps toward serious attire for future space travelersFriday night in front of a young, hip crowd of artists and tech geeks in Manhattan. The blueglove was designed by Moscow-based spacesuitengineer Nikolay Moiseev, who built in unprecedented flexibility at themetacarpal knuckles of the hand. The black glove represented a single-layerdesign made from urethane by Brooklyn-based inventor and artist Ted Southern,which reduced the torque required to move the fingers to practically nothing. "Inthe future, our plan is to actually blend the two and make a low-torque,single-layer, metacarpal glove," Southern said to the assembled crowd. "And it's going to happen." Moiseev andSouthern first combined their talents as former competitors to win a $100,000second place prize in NASA's 2009 astronautglove challenge. Now they have expanded their partnership under the name ofFinal Frontier Design to go from glove to full-fledged spacesuit designed to beworn inside a spacecraft during launch and re-entry. Aninteractive vacuum chamber glove box allowed visitors to try out the fingerflexibility for themselves by tackling a Rubik's Cube. One participant jokedthat the cube represented the harder task at hand. The glovesrepresent the duo's self-admitted specialty, but the older Moiseev has alreadybegun looking ahead to the other challenges of spacesuit design. Theengineer's passion became evident as he demonstrated the three-step unlock andtwist system for attaching the gloves to the suit, and also pointed out aunique front-entry zipper on the torso. Both features made donning the suit fareasier than others, Moiseev said. Moiseev andSouthern push a design philosophy that embraces easier manufacture. Southerncreated spacesuit pieces from heat-sealed nylon coated by urethane laminant inhis art studio. "Ourwhole angle is super-easy manufacture and very affordable," Southernexplained. Manufacturingthe pressure suit components alone had cost perhaps $15,000 in all, Southernsaid. That price does not include all the other parts of a working spacesuit,such as communications gear and life support. Still, itmay give a potential edge over rival spacesuit makers such as OrbitalOutfitters, who aim to create spacesuits with a price tag of approximately$100,000, according to Southern. "Ithink we can cut that to one half, or even one third," Southern told SPACE.com. The FinalFrontier Design team has hopes that their spacesuit could eventually catch theeye of a commercialspaceflight such as SpaceX in California. The finalefor the evening came in the form of a burst test, where Southern kept airpressure pumping into a capped pressure suit arm until something gave way. NASApressurizes its spacesuits to about 4.3 pounds per square inch (psi). "Thisis the most anticlimactic test possible," Southern joked. The crowdstill paid rapt attention anyway, with some wearing oversized safety gogglesdistributed by the designers. Southern counted off the pressure at intervalsuntil a distinctly deep pop sounded at 13.5 psi. Moiseevambled over and conferred with Southern, who noted that one of the plastic capson the ends of the arm had given way. "Ithink we can get way higher than 14 [psi]," Southern said. "I want togo over 15." The cap wasreplaced, and the test reset. A smaller group of onlookers murmured as the armswelled visibly and pressure hit 16 psi, which represents a benchmark standardfor NASA tests. Finally thecap gave way once more at 26 psi, and Southern looked much more pleased. Heturned to Moiseev for the engineer's input regarding standards for burst tests. "21psi is a good number," Moiseev confirmed. Why Are Astronauts' Spacesuits Orange?